Earlier this week through my new found friends on twitter, a community of other foodie bloggers I have been so graciously accepted in. I learned of Jennifer Perillo (in jennie’s kitchen) and her life changing, unexpected event. Her husband, a father of two, passed away suddenly of a heart attack. My soul ached and still does when I think of how they now have to pick up the pieces, somehow through all this….they must still breath. I don’t know Jennifer or her family or the people whom I heard the news from but I felt it. I wanted to be there, for them. In a way from a distance, just giving my positive energy, prayers, vibes, call it what you may. I then came across Jennifer’s post For Mikey. I have no idea how she had the strength to write it and share this. But she did and i’m grateful for it. For now, I can be there for her, we can be there for her. We can pass on Mikey’s favorite pie, share it with the world, with our families. His memory will live on every time I make this pie. 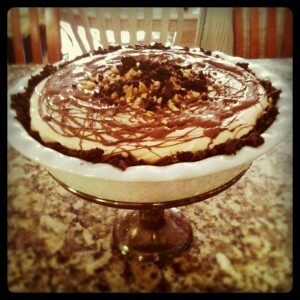 It’s Mikey’s Creamy Peanut Butter Pie. So join me and many others as we make today- Creamy Peanut Butter Pie Friday- For Mikey. May his soul rest in peace and his family make it through this dark time. Add the cookies to the bowl of a food processor and pulse into fine crumbs. Combine melted butter and cookie crumbs in a small bowl, and stir with a fork to mix well. Press mixture into the bottom and 1-inch up the sides of a 9-inch springform pan. Melt the chocolate in a double boiler or in the microwave. Pour over bottom of cookie crust and spread to the edges using an off-set spatula. Sprinkle chopped peanuts over the melted chocolate. Place pan in the refrigerator while you prepare the filling. Pour the heavy cream into a bowl and beat using a stand mixer or hand mixer until stiff peaks form. Transfer to a small bowl and store in refrigerator until ready to use. Place the cream cheese and peanut butter in a deep bowl. Beat on medium speed until light and fluffy. Reduce speed to low and gradually beat in the confectioner’s sugar. Add the sweetened condensed milk, vanilla extract and lemon juice. Increase speed to medium and beat until all the ingredients are combined and filling is smooth. Stir in 1/3 of the whipped cream into the filling mixture (helps lighten the batter, making it easier to fold in the remaining whipped cream). Fold in the remaining whipped cream. Pour the filling into the prepared springform pan. Drizzle the melted chocolate on top, if using, and refrigerate for three hours or overnight before serving.